The Sky Blue is a member of the elpis subgroup, which is characterized by the post-discal band on the forewing beneath being completely dislocated at vein 3. Beneath, on the hindwing, the second white stria from the base in space 7 is either in line with the third stria from the base in the cell, or at least nearer to this stria than to the second cell stria. 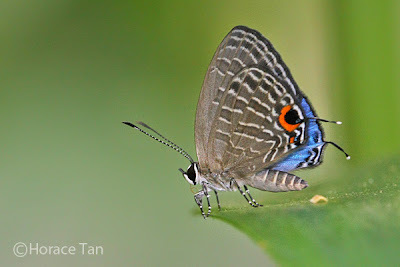 Above, the male is sky blue, with forewing border increasing to about 1.0mm at the apex, and with marginal spots absent from the hindwing. The female has blue deeper and more shining than the other species of the group. Each hindwing features a large black-centred orange-crowned tornal spot, submarginal orange markings along veins 1b and 4; and a white-tipped filamentous tail at the end of vein 2. A male Sky Blue perching on a leaf in an urban garden. 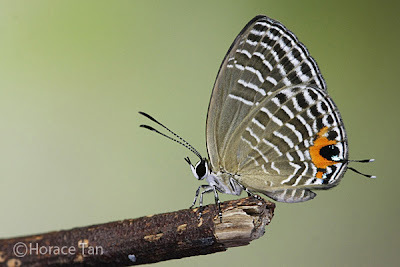 The same male Sky Blue giving us a glimpse of its sky-blue upperside. 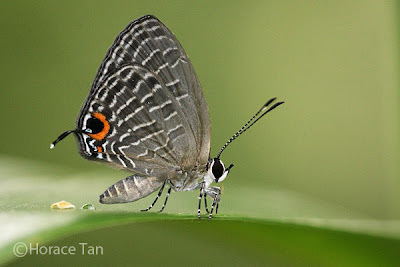 This species is rarely encountered in Singapore. There were only a handful of sightings of lone specimens in the nature reserves until the discovery of a small colony in an urban garrden in the early part of this year. At this site, the males were observed to be flying around in sunny weather, and puddling on wet ground. 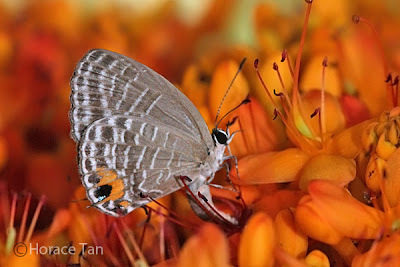 A number of females were also busy with their egg-laying tasks on the Saraca flowers which were blooming at that time. The local host plant, Saraca cauliflora (Yellow Saraca) is a small to medium-sized tree with pinnate leaves in 4-6 pairs. 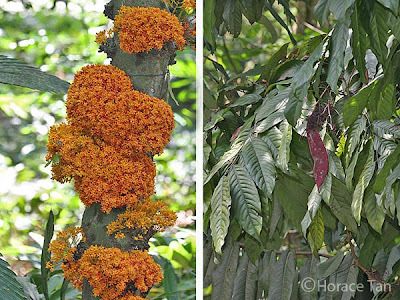 The flowers are orange-yellow in large clusters on trunk or branches. Seed pods are large, flat and purple. Yellow Saraca can be found in many parts of Singapore such as urban parks, roadsides as well as the nature reserves. The early stages of the Sky Blue feed on various parts of the flowers. A mother Sky Blue laying her eggs within a cluster of Yellow Saraca flowers. Eggs of Sky Blue are laid in the flower clusters of the Yellow Saraca, typically singly on flower parts such as the petal, sepal and pedicel . The egg is disc-like (about 0.6-0.7mm in diameter) with a depressed micropylar, and light green in colour. The surface is covered with a reticulated pattern of intersecting ridges. 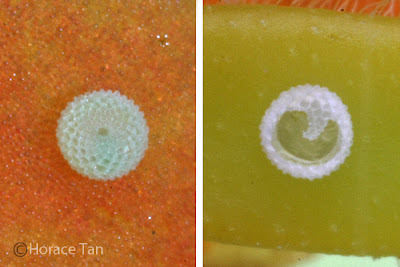 Left: egg laid on petal; Right: empty egg shell. The collected eggs took 2-2.5 days to hatch. The young caterpillar emerges after nibbling away sufficiently large portion of the egg shell. Measured at a length of about 0.9mm, its pale yellow body is cylindrical in shape, sporting long fine setae (hairs) and a dark head capsule. A black prothoracic shield is prominently featured. 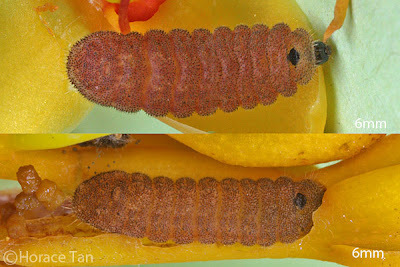 A newly hatched caterpillar of the Sky Blue, length: 0.9-1.0mm. The newly hatched grazes on the surface of flower petals or bores into a flower bud for the goodies within. Later instar caterpillars also eat the pedicel of the flowers. As it feeds and grows, it gradually takes on a yellowish brown coloration with a strong pinkish tinge. 1st instar caterpillars. 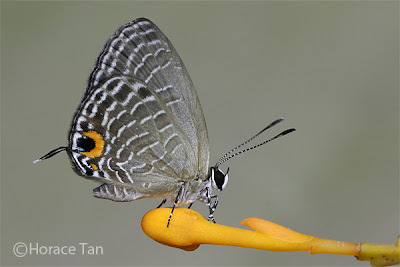 Top: late in this stage, length: 2.5mm. 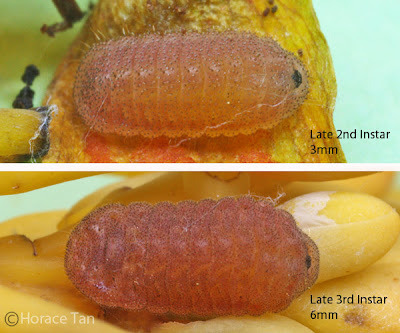 Bottom: in dormant mode prior to moult, length: 2mm. 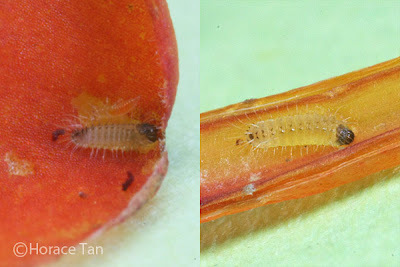 After about 1-1.5 days of growth and reaching a length of about 2.5mm, the caterpillar has its body shortened while lying in a dormant stage to prepare for its moult to the next instar. The moult eventually takes place after 0.5-0.75 day in the dormant stage. 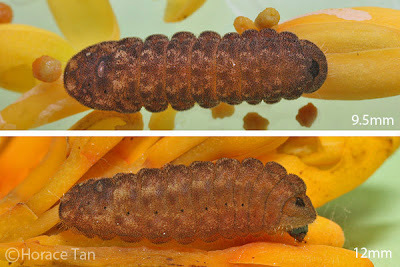 The 2nd instar caterpillar is yellowish brown with very strong hint of pink and red. The body surface appears to be covered with tiny reddish spots, and fine setae. The prothoracic shield is black in colour. 2nd instar caterpillars. Lengths: 2mm (top); 3.5mm (bottom). The 2nd instar caterpillar reaches a length of about 3.5mm, and after about 2-3 days in this stage, it moults again. The 3rd instar caterpillar has numerous short and fine body setae. There are rather faint dorsal and lateral markings on the reddish brown body. Both the dorsal nectary organ (on the 7th abdominal segment) and tentacular organs (on the 8th abdominal segment) are now easily discernible. The 3rd instar takes 2.0-2.5 days to complete with the body length reaching about 6.0mm. Late 2nd and late 3rd instar caterpillars, both in shortened and dormant stage prior to their moults. Moulting to the 4th instar. 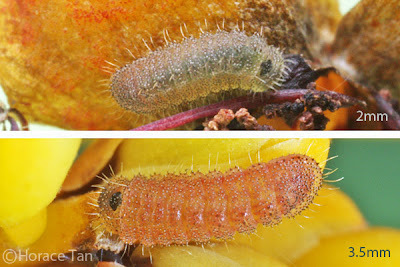 The 4th (and final) instar caterpillar is similar in appearance to the 3rd instar caterpillar. Overall, the caterpillar has taken on a darker shade of reddish brown. With increased size and greater contrast in the markings around them, the nectary organs now are now very prominent. Contrasting markings with sinusoidal outlines run dorsally from the prothoracic segment to the dorsal nectary organ. Bottom: late in this stage, length: 12mm. Nectary organs and prothoracic shield of a 4th instar Sky Blue caterpillar. 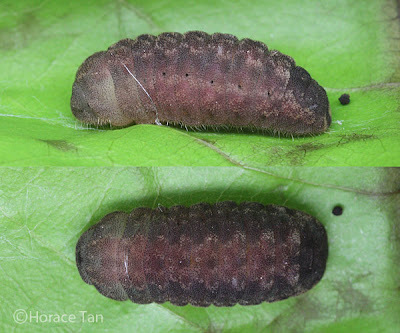 After 4-5 days of growth and reaching a maximum length of around 12mm in the final instar, the body of the caterpillar gradually shrinks, and finally takes on a dark purplish brown coloration. All bred specimens chose to enter their pre-pupatory phase in tight pockets of space within leaf debris. At the chosen spot, the caterpillar readies itself for pupation by spinning a silk girdle and a silk pad. The caterpillar secures itself to the silk pad via claspers on its posterior end. Two views of an immobile pre-pupatory larva of the Sky Blue. Pupation event of a Sky Blue caterpillar. Pupation takes place after one day of the pre-pupal stage. 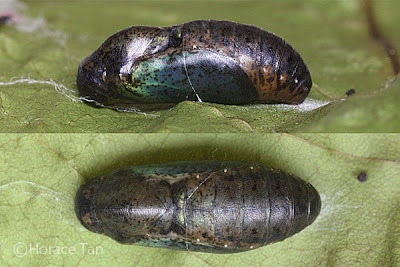 The pupa has the typical lycaenid shape. It is beige in base color with a fair number of brown and black specks. 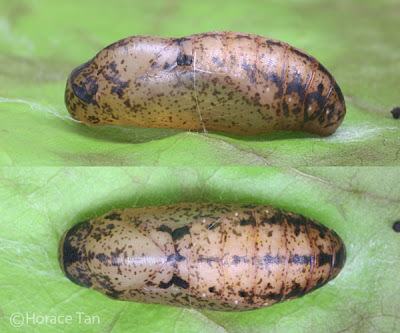 The pupa has a length of about 9mm. Five days later, the pupa becomes darkened in color signaling the imminent emergence of the adult. The markings on the upperside of the forewing become visible through the pupal skin, and it is now possible to tell the gender of the soon-to-emerge adult. The next day the adult butterfly emerges from the mature pupa. 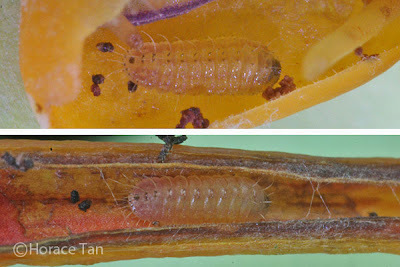 Two views of a mature pupa of a female Sky Blue.